In partnership with Oldways, our dietitians recently led class participants on a culinary journey through African foods in our “A Taste of African Heritage” nutrition education class. Attendees learned how to prepare spices and herbs, leafy greens, whole grains, beans, tubers, fruits, and vegetables that have sustained Africans and their descendants for generations. 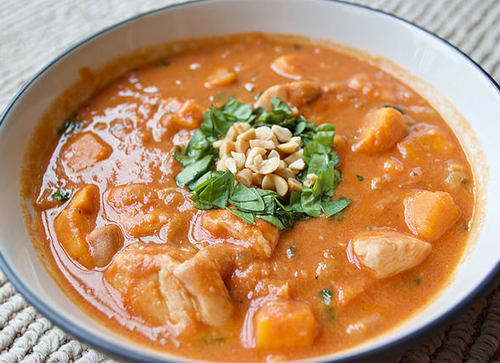 A popular recipe featured in class was Senegalese Sweet Potato Peanut Stew. Heat the oil in a large soup pot on medium heat and saute the onion and garlic until translucent (3 to 4 minutes). While the onions and garlic cook, chop up the sweet potato, carrots, and zucchini. Add sweet potato and vegetables to the pot; saute for 3 to 4 minutes. Add the diced tomatoes, vegetable broth, and curry poweder, and bring to a boil. Simmer for another 10 minutes or so. After 10 minutes, add peanut butter and thyme to the stew. Let it cook for another 3 to 5 minutes.